Now I don't often write about commercial ice cream companies but today I'm going to. No, I'm not about to do any promotion or advertising for any of them in case you're thinking that! This is a little different and I hope you will agree with my conclusion. At a time of recession, many people's minds are focused on the potential for business to stay alive. For the past few years, however, it has been the opposite - seemingly everyone focusing on the potential for business growth. Of course, in the last decade or so many small companies have grown large, some even into corporate giants but that does not tend to happen in the ice cream sector. Why is it that? Many small ice cream companies stay small - do they choose that or is it inherent in the nature of the business? I was chatting recently with someone who runs a b&b in Carlisle close to the English Lake District and Scottish borders and we started to talk about the number of small ice cream companies in their area. Being a predominantly dairy farming area it would seem only natural that ice cream is made here and that certainly seems to be the case with a great "cottage industry" based around ice cream including ice cream parlors and tea shops catering for the many tourists that flock to the English Lakes each year. So why are there no large ice cream companies in the area? Perhaps ice cream as a busines is just not scaleable - it must be difficult to maintain the quality yet retain the uniqueness above a certain level. Perhaps each dairy farm has a limit to the dairy produce it can provide and the owners have no desire to expand. Perhaps the cost of buying extra equipment to expand is prohibitive. The above are what the business guru Michael Porter would call "barriers to entry". It think there's an important point here though - perhaps we are actually better off for these flaws in the way the economics of it all works. Personally, I prefer the idea of staying small when it comes to ice cream - that way we can enjoy the benefits of a broad range of companies whose ice cream making is distinctive in its own way. 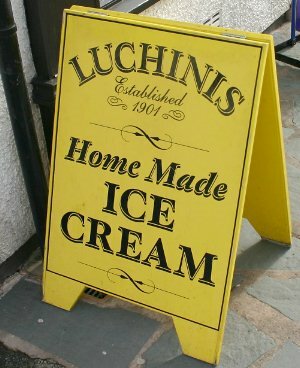 I was lucky enough to visit an ice cream parlor in Keswick called Luchini's and the experience backed up my point perfectly. A family run business making delicious homemade ice cream since 1901 - over a 100 years! A passion for ice cream that has lasted from generation to generation. Now that's something special worth preserving. I hope to write about Luchini's again shortly and in more detail, sharing with you some of the super ice cream photographs I took.